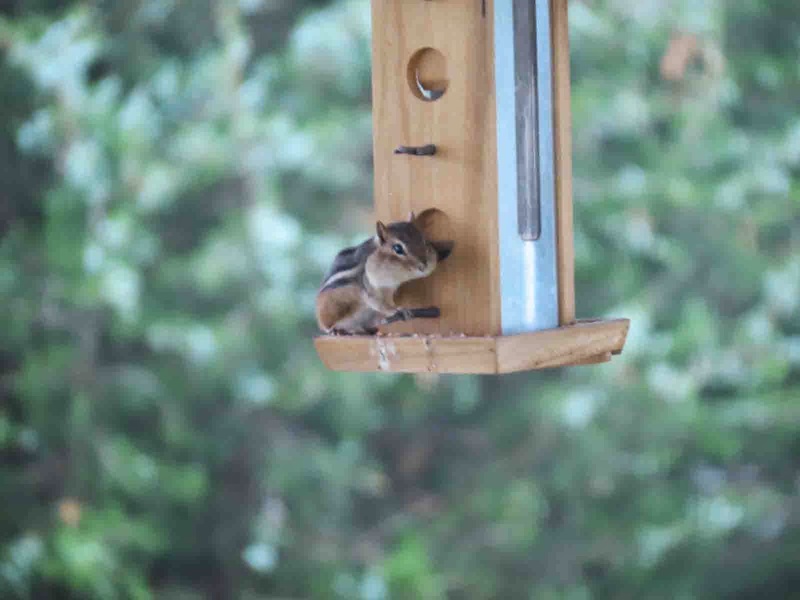 This is the story of Chippy and the $150 bird feeders. This past winter my next door neighbor put a bird feeder in her yard. 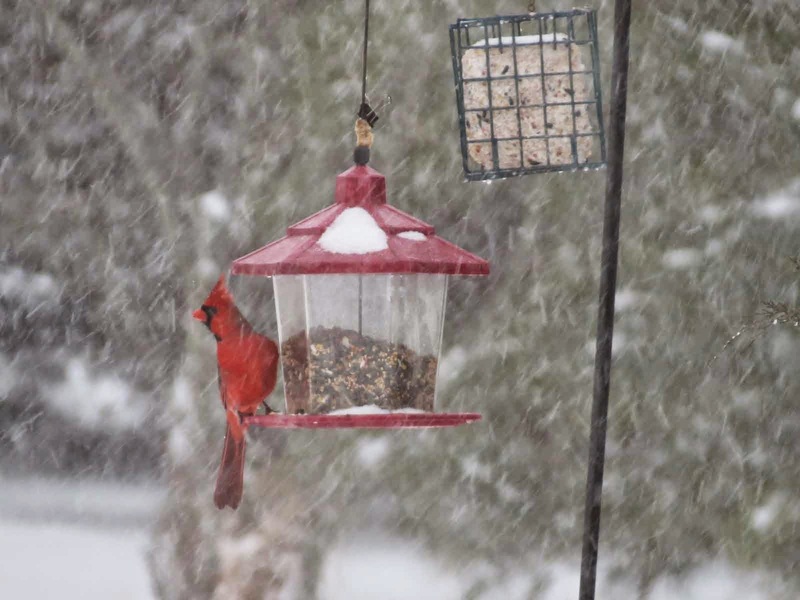 One day, as I was sitting in our sun room watching one of the snowiest storms of the season, a brilliant red bird flew by the window and perched on the feeder. Large flakes zig zagged in all directions in the fierce wind. The bird clung to the dome topped feeder as it swung wildly back and forth. Before that I had not paid much attention to birds. But after that day, I started to notice them. While on our morning Rico walks, I began to recognize the cardinal’s call. I noticed another bird, similar in looks, but not red in color. I realized it was the female cardinal. 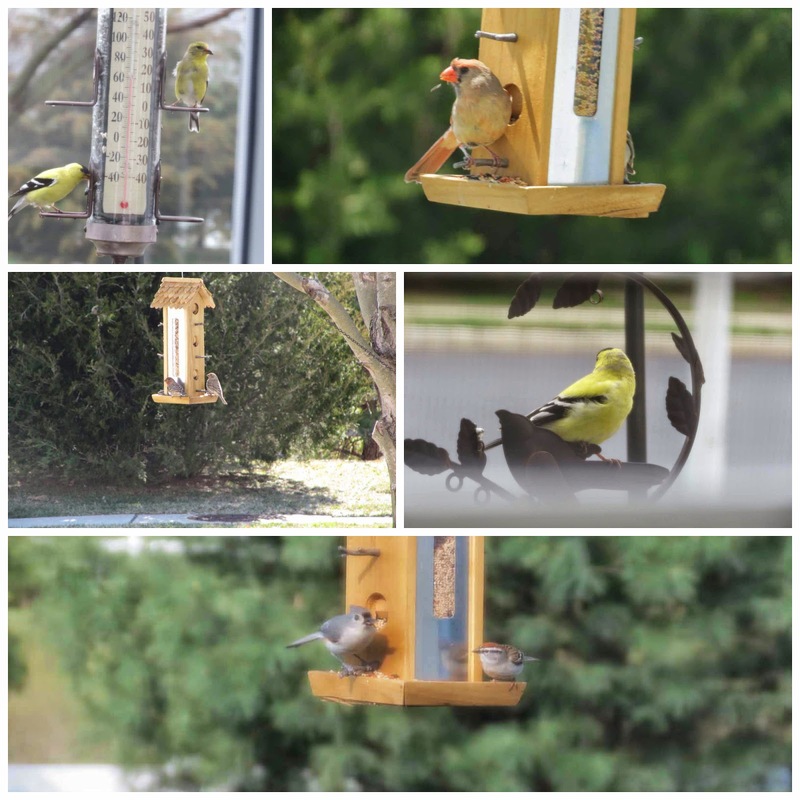 Then I became somewhat obsessed about photographing all of the different types of birds right in our neighborhood. 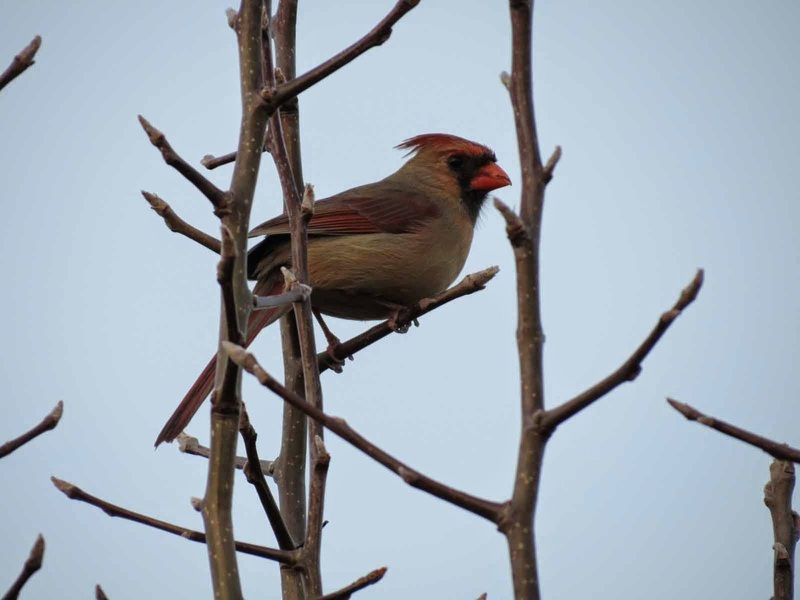 During the winter when the trees are bare, it is easy to spot the birds. But now that the trees are filled with foliage, I can clearly hear them but they are hidden among the leaves and are not as readily seen. The people next door left for their summer beach house a few weeks ago. That means an empty bird feeder which also means no birds to watch from my sunroom. I decided that if I want to continue to enjoy these interesting creatures, I should put up my own feeder. And that’s what we did. We put one right outside of our window on a shepherds crook. It has a thermometer. We hung the other one from a branch of the tree in our front yard. We have tons of chipmunks this year. I thought one was a rat in the garage. Cute. I think I only see the one, but I was told there is never only one. How cute with the chipmunk wanting to come by to share in the food. 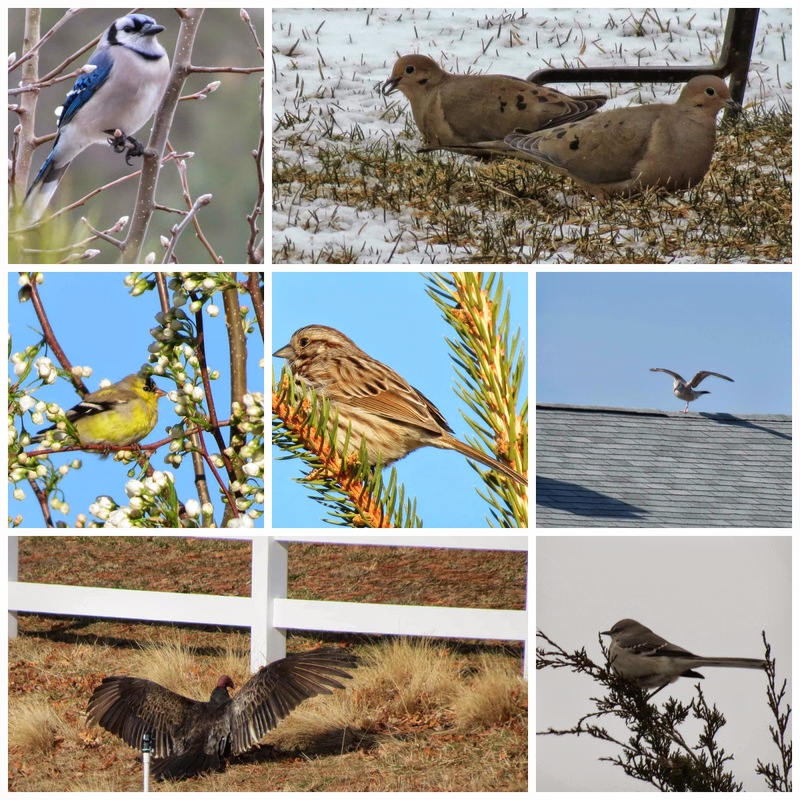 Such a pretty variety of birds you got pictures of! Always fun to watch them eat and fly around! The chipmunk is cute, but he takes more than his fair share. The birds have been quite a welcome distraction for me. Well, of course there'd be a chipmunk! I kinda want a hummingbird feeder to attract hummingbirds. Maybe you should try that, too. Great pics! I thought about a hummingbird feeder, but I read that the nectar attracts insects, such as bees, wasps and ants. Of course as you can see, regular feeders attract other than birds also. We live in a community with rules and regulations. We aren’t supposed to have bird feeders in our yards because of the fear that they may attract insects and rodents. I haven’t seen any of those and so far the “association” hasn’t cited us. We are enjoying the birds.